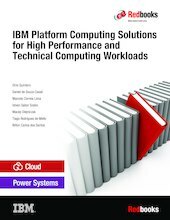 This IBM® Redbooks® publication is a refresh of IBM Technical Computing Clouds, SG24-8144, Enhance Inbound and Outbound Marketing with a Trusted Single View of the Customer, SG24-8173, and IBM Platform Computing Integration Solutions, SG24-8081, with a focus on High Performance and Technical Computing on IBM Power Systems™. This book describes synergies across the IBM product portfolio by using case scenarios and showing solutions such as IBM Spectrum™ Scale (formerly GPFS™). This book also reflects and documents the IBM Platform Computing Cloud Services as part of IBM Platform Symphony® for analytics workloads and IBM Platform LSF® (with new features, such as a Hadoop connector, a MapReduce accelerator, and dynamic cluster) for job scheduling. Both products are used to help customers schedule and analyze large amounts of data for business productivity and competitive advantages. This book is targeted at technical professionals (consultants, technical support staff, IT Architects, and IT Specialists) that are responsible for delivering cost-effective cloud services and big data solutions on IBM Power Systems to uncover insights among client data so that they can take actions to optimize business results, product development, and scientific discoveries.